Ok, it feels like the countdown is really beginning. I still can’t believe how fast this is all going. 9 months seemed like such a long time on the front end! At our last doctor’s appointment, the midwife said that if I go into labor a week from now, they won’t do anything to stop it – i.e. the baby will be medically ok. That is not to say that the baby is coming in a week. The due date is still July 7(ish), and I was measuring a little small at the last appointment. So don’t get super excited. But it is very intimidating. We still have so much to do! The baby’s room now has organized piles of gifts and gear. The changing table/dresser is halfway finished. Once that’s done, I can actually put away all the baby clothes I have so carefully washed, folded, and separated by size. The crib is still in its box, waiting to be assembled. But we have a bassinet and a moses basket for the kid, so if she does arrive early, there is a place for her to sleep even if the crib isn’t finished. And honestly, she won’t really be using the crib for a while anyway as she will probably be sleeping in the moses basket or bassinet in our bedroom for the first couple months. Now that I am 35 weeks, I am definitely entering the “this is not so comfortable stage” of pregnancy. In comparison to complaints I’ve heard from a lot of other pregnant women, I seem to have had a relatively easy pregnancy so far (you never know, karma could come kick me in the behind when it comes time for labor). But please allow me a little digital space to vent about what ails me now. My belly is now so heavy that sleeping is definitely not the most comfortable thing in the world. Imagine strapping a 25 pound backpack onto your belly and NEVER taking it off . . . now imagine that backpack is under your skin, so your skin has to stretch to accommodate it - that’s getting close to how it feels. When I sleep, I have to stick a pillow under my belly for support so that gravity doesn’t pull it too much down towards the bed. Then I have my body pillow that I curl up with and stick between my knees to alleviate any hip pressure. Plus I have a pillow at my back so that I don’t accidentally roll over on my back in the middle of the night (once you hit a certain point in your pregnancy, you are not supposed to sleep on your back). Poor Aaron has to deal with the fortress of pillows surrounding me when he finally climbs into bed. Next time I’m getting one of those special pregnancy body pillows! Once I do wake up, transitioning from the laying down position to a standing position is an exercise in and of itself! My ab muscles are pretty much useless at this point because they are so stretched out, so in order to go from laying to standing, I have to roll over on my side, and push/crawl my way up with my arms. Then I wiggle my way to sitting with my legs off the bed, and very slowly stand up. The weight of the belly first thing in the morning makes it really painful if I stand up too quickly. And then there’s the sciatic pain that emanates from my tailbone making it impossible to stand quickly anyway. The other discomfort that I have fairly often is from the baby sticking out from under my ribs. I swear this kid is growing exponentially every night! Literally, the other morning I woke up, and put my hand on my belly and it was noticeably bigger than the night before! She seems to like to hang out under the right side of my rib cage. She’ll poke out or kick and I try to massage her back in a little bit because it can get really uncomfortable. Though, right now as I type this, she seems to be sticking directly out of my midsection, like a little alien, which I have to say is much more comfortable than sticking out the side. 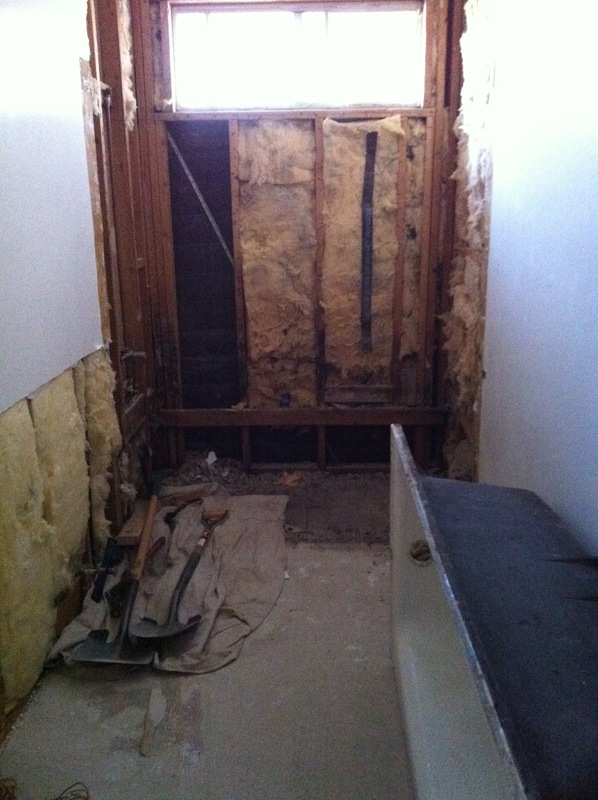 Also, for those of you who don’t know, we are remodeling our master bathroom. 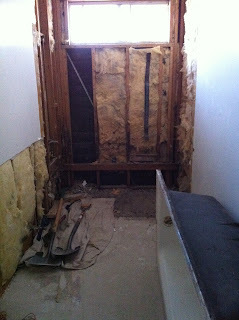 Five weeks before the birth of our first child might seem like an odd time to start a major renovation project (we are gutting the entire room and replacing everything). But we figured it was probably better (and safer) to do it while the kid is still contained on the inside rather than dealing with a squirmy little one and construction dust at the same time. Wish us luck!